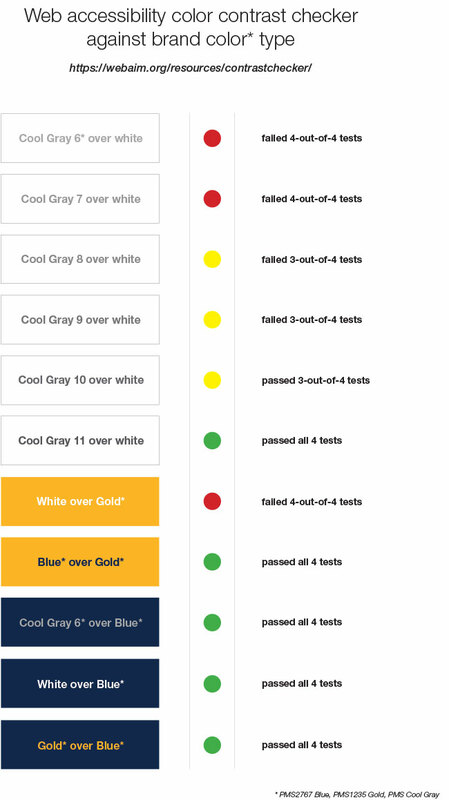 The primary University colors are gold, white, navy blue and gray. Inspired by the selection of the daisy as the official school flower in 1893, the first school colors were gold and white. In 1987, navy blue was added to provide better visual contrast to publications, merchandise and athletic uniforms. 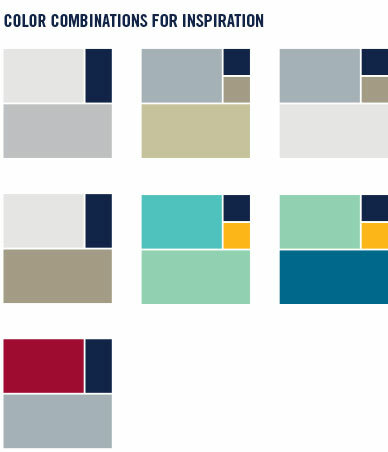 In 2018, gray was elevated from a supporting color to a primary color. The addition of gray as a primary color modernizes and connects the University’s logos and icons– Minerva and the Spartan, Spiro. It also supports our efforts to better convey our relationship to the UNC System while highlighting our hometown, Greensboro, and our “G” identity. To maintain visual consistency across mediums, the University’s color pantones and CMYK vary per color. The chart below details the proper color pantones and CMYK (coated and uncoated) to be used by medium below, i.e. web, print. Brand marketing and communications shall use a bright, white design. This light design enables content and imagery to connect with the audience as color primarily is delivered through photography. The new University mark features the three primary colors from the University Brand Guide: PMS 2767 (blue), PMS 1235 (gold) and Cool Grey 6 (grey). The single color versions of the mark may only be in black or navy. University Communications completed the process of finalizing the CMYK (cyan, magenta, yellow, and black) color builds for the new brand colors. 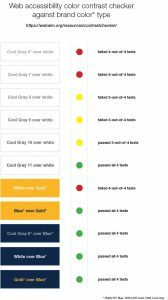 Navy, gold, and gray are the only colors updated with this new information. In this process, the CMYK numbers have been finalized for different print production equipment and different types of paper to ensure brand color consistency. Therefore, there are different CMYK color builds for offset and digital printing, as well as for coated and uncoated paper. Offset printing means conventional printing with a printing press that uses plates. Digital printing means a printing press that does not use plates, and is generally used for projects that require fewer quantities. These CMYK color builds provide our schools, colleges, and departments with better color consistency across vendors, printing equipment, and paper styles. Illustrated below is the breakdown for spot and CMYK printing as well as HEX and RGB for web applications. To provide flexibility while maintaining a consistent look across the marketing and communication materials, the University maintains a palette of complementary, bold and neutral colors. The University’s supporting colors are to be used as design accent color options only. Most work should heavily focus on and emphasize our primary colors, not our secondary ones. Readers may have difficulty when text, images and the background color are too close together in the color spectrum. The measure of this variation is contrast ratio. A good example of this is that you would not want to put navy blue text on a black background because there is not enough contrast ratio to allow good separation between the text and the background. It is best practice to ensure that text and backgrounds have a contrast ratio of 4.5:1 and there are tools on the web to help determine the contrast ratio. Combinations of the University colors have been tested with an accessibility color contrast checker to determine if the contrast ratio is high enough to maintain easy readability. The cool gray color is not dark enough to provide contrast on a white background. While we recommend using the gold in a very limited fashion you should note that white text on the gold background also fails most tests. Cool gray, gold and white all provide acceptable contrast on the University blue. We recommend testing color combinations for acceptable contrast ratio as you design. A good tool is at https://webaim.org/resources/contrastchecker/.